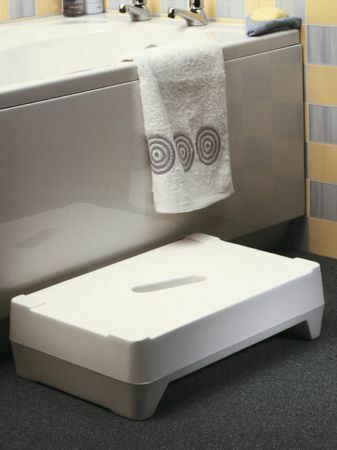 The Ashby Step Two Bath Step is a strong and very stable bath step that has a large textured surface area that gives excellent user confidence and that is ideal for heavier users. The step has a centrally located lifting hole, making it very easy to use and very easy to position or remove as required. The Step Two Bath Step is reversible to give the user two different options for the height of the step. When placed on its feet the bath step is 150mm (6") high, when reversed and placed on its flat side the step height is reduced to 100mm (4"). For user safety both sides of the step have a non slip rubber foot at each corner. A practical and safe adjustable aid. Excellent buy.